Scotland Spey casting lessons and salmon fishing courses. Spey Casting Lessons and Salmon Fishing Courses in Scotland. Fishing in Scotland provides a comprehensive range of fly fishing and Spey Casting lessons for complete beginners to advanced levels. We have a very select team of highly experienced and knowledgeable salmon fishing guides and Spey Casting instructors who are renowned for their expert teaching abilities, good humour and endless patience. Our Spey Casting lessons predominantly take place on quality salmon fishing beats of the River Tay in Perthshire and the North Esk in Angus within an hours drive of Edinburgh, Dundee or Aberdeen although we can arrange lessons on numerous other rivers throughout Scotland. We cater for individuals or groups and offer 1 day Spey Casting lessons to 3 and 6 day Spey Casting and salmon fishing courses which include permits, rods, reels, lines, safety vests, waders and a good selection of hand tied flies. Spey Casting is not that difficult to learn providing you are shown correctly. Some people can cast quite proficiently within an hour or so and others just take a bit longer to perfect the timing. Your lessons will be at your own pace and tailored to meet your specific level of experience whether you are a complete beginner with no experience at all or you are looking to improve on your existing casting techniques. One of our most popular courses is our 3 day beginners course spending a day on each of 3 different rivers. We start with a day on the South Esk which is the smallest of the 3 rivers and very easy to fish. The size of the South Esk makes an excellent and very comfortable river for beginners to start on and learn the basics of Spey Casting. On day two we take you to the North Esk which is bigger than the South and a great venue to advance your casting skills. On day three we take you to a top beat of the River Tay, a natural progression to where you can perfect your Spey Casting skills on one of finest salmon rivers in Scotland surrounded by some of the most beautiful scenery in Perthshire. 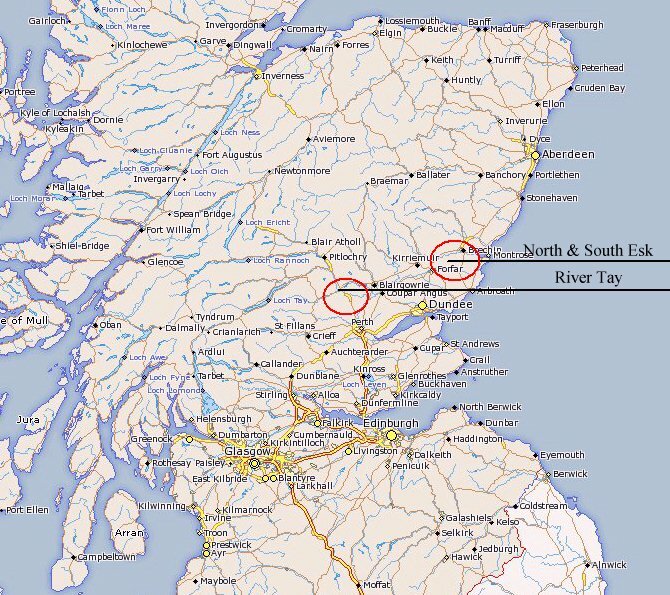 Alternatively we can give you 3 days on different beats of the River Tay or any combination of these rivers. If you join us for 1 day we can take you to the river of your choice although we would probably recommend a good quality beat on the River Tay to give you the experience of Spey Casting on a bigger river. The Tay because of it's size is also less dependant on good water levels to fish well. We will not only teach you how to Speycast but just as important, we will teach you the art of watercraft and how to read the river, to know where the salmon are most likely to be lying and how to present the fly correctly. How to hook, play and net a salmon is as important as learning how to catch one. More fish are lost at the net than at any other time. We will teach you how to do this to ensure that the fish you hook, you successfully land. of fly fishing, Spey Casting and Atlantic salmon fishing, many of which come back to fish with us every year. Our one day fly fishing course is designed to give you a basic introduction to Spey Casting and how to cast with a fly rod correctly or for the experienced fisherman, diagnose casting faults, correct bad casting habits and advanced casting techniques. Our 2 day and 3 day courses will cover everything in a lot more depth and give you plenty of time to perfect your casting. We can also assist in arranging local hotel accommodation for you and your guide/instructor will pick you up from your hotel each morning and take you to the river. Airport transfers from Edinburgh or Aberdeen can also be arranged. This style of casting with a double handed salmon fishing rod was called Spey Casting as it is thought to have been developed on the River Spey in Scotland. 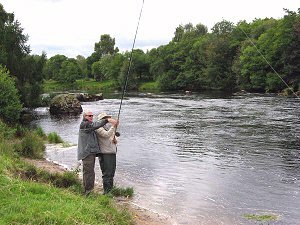 There are a number of reasons why Spey Casting was developed but the two main reasons were to be able to cast a line a greater distance and to eliminate the back cast which meant that streches of river with a high banking or obstacles behind the angler such as trees or bushes could still be fished. Although you can Spey cast with a single handed rod , Spey Casting was developed for use with a much longer double handed salmon fishing rod which casts a line a much greater distance. Initially in the mid 1800s these rods were about 22ft long but today with the use of more modern materials, double handed salmon rods are in the region of 13ft to 15ft in length. Thank you so much for a great day on the river. To be able to teach 3 total beginners how to cast with a salmon fishing rod in the space of just one day is a true testiment to the teaching skills of your guide. The advice he gave us on buying our own tackle was invaluable and will no doubt ensure that we have the right equipment to start with and hopefully enjoy salmon fishing for many years to come. This was truly a wonderful experience for us all from start to finish everything from being picked up from our hotel in the morning to being dropped back in the evening was arranged perfectly. Moray's knowledge and teaching abilities combined with his great sense of humour gave us a day far better than we could have imagined. We hope to come back for a couple of days of salmon fishing later this year and sincerely hope you can accommodate us.